In most cases the CIFA Technical Paper series deals with subjects that are comprehensive geographically, or technically focused. However, from time to time work at the national level, or on a few aquatic systems, can serve as a good example for other countries, especially where management of fishery resources is the objective. The present report is just such a case. The technical paper endeavours to integrate the results produced by the activities in linking biological findings, stock-assessment and predictions with economic values. This facilitates evaluation of the effects of management options on the income and employment generated by each of the fisheries, as well as the income per participating fisherman. It was presented for discussion to government at a Workshop held in Mangochi from 8–11 July 1992 and a management strategy was agreed upon, requiring changes in the Malawi Fishery Laws. This paper is based on the work of N.P. van Zalinge, Chief Technical Advisor/Senior Fishery Biologist; G.F. Turner, Fish Biologist; M. Mdaihli, Socio-economist; M.B.D. Seisay, UNV Fishery Biologist; S.B. Alimoso, Malawi Government Fishery Statistician; S. Donda, Malawi Government Economist; M.C. Banda, Malawi Government Fish Biologist; M.M. Hara, Malawi Government Fish Marketing specialist; N.C. Mwanyama Malawian PhD student and the Malawi Government field assistants J. Phiri, J. Thindwa, A. Bowa, M. Bezai, P. Mpezeni, A. Simon, H. Mtonga, M. Gidion, K. Kasuzweni, O.K. Mhone, L. Phiri and L. Mzunzu. This report was originally published as Technical Report 1 of the GOM/UNDP/FAO Chambo Fisheries Research Project, Malawi (MLW/86/013). Some of the workshop- related material (Annex 2) has been edited out, but the remainder remains the same. GOM/FAO/UNDP Chambo Fisheries Research Project. FAO, Fisheries management in the south-east arm of Lake Malawi, the Upper Shire River and Lake Malombe, with particular reference to the fisheries on chambo (Oreochromis spp.). CIFA Technical Paper. No. 21. Rome, FAO. 1993. 113p. This report summarizes the results of a four-year Government of Malawi/UNDP/FAO project to establish the basis for a management strategy for the chambo (Oreochromis spp.) 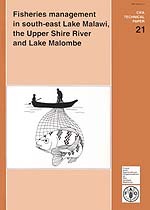 fisheries in the South-East Arm of Lake Malawi, the upper Shire River and Lake Malombe. Three species were the focus of the study, but because of the complexity of the fisheries and their multispecies character, it was necessary to take account of the other stocks involved. The report lays out, then integrates the findings from a broad spectrum of investigations including fishery statistical systems and data, taxonomy, biology and growth of chambo with attention to other important fishes, stock assessment, descriptions of the fisheries, socio-economics and fish marketing. Also included are detailed scenarios and recommendations for the management of the fisheries including social and economic consequences. Following Government's Fishery Policy (1987–96), FAO/UNDP and the Malawian Fisheries Department have jointly undertaken a project of which the main immediate objective was: to carry out research to formulate a suitable management plan for the Chambo (Oreochromis spp.) fisheries in the south-east arm of Lake Malawi, the Upper Shire River and Lake Malombe. This report contains the proceedings of the workshop held to provide a forum at which the recommendations for the management of the fisheries of the above mentioned area and the supporting research findings could be presented and discussed. Although the emphasis of biological stock assessment research was on chambo, the degree of interaction present between the seven major types of fisheries in the project area necessitated treatment of the other stocks involved. For management purposes the above was complemented by socio-economic investigations (baseline, cost and earning, fish marketing surveys). A gear-based statistical data collection system was introduced to replace a less effective boat-based system and was adopted by Government for country-wide application. Lake Malombe fish stocks are only exploited by artisanal fisheries. While the chambo stocks have collapsed, the nkacha/kambuzi seine net fishery has increased its catch to the extent that overall fish production from the lake has remained more or less the same, though there has been a substantial decline value, due to price differences. Apart from kambuzi species, seine nets catch large numbers of the juveniles of chambo and other species, and thereby cause recruitment overfishing. Thus the kambuzi stocks are now also in danger of becoming overfished. In the Upper Shire river all stocks have collapsed, while in the south-east arm of Lake Malawi all stocks are fully exploited and no further effort increases can be sustained. The biological, stock assessment and socio-economic findings were used to evaluate predictive scenarios developed for different management options. This facilitated the choice of the management strategy best suited to the prevailing conditions. Numbers of fishermen: Free access to the fisheries of Lakes Malawi, Chiuta and Chilwa and to the Upper Shire river should cease and the numbers of fishermen should in future be strictly limited by a system of licences. Such licensing would incorporate the requirements for the control of effort through the limiting of gears. Gear use: The total numbers of gear units in use on above mentioned waters should not be allowed to increase beyond the present levels. This is intended to stabilize fishing effort and should be considered with reference to the suggested changes in the specifications and types of gears proposed. For Lake Malombe recommendations were made to allow nkacha seines to continue to fish and kambuzi seine operators to change to nkacha net fishing. Proscibed gears: The use of fine meshed kambuzi/chalira seine nets should be totally prohibited on Lakes Malawi, Malombe and the Upper Shire river. The nkacha seine net should be banned on Lake Malawi. All beach and open-water seines should be banned on the Upper Shire. Gear specifications: The minimum mesh size for gillnets and chambo seine nets should be fixed at 95mm stretched mesh on Lakes Malawi, Malombe and for the gillnets on the Upper Shire river. The minimum mesh size for nkacha seines on Lake Malombe should be fixed at 25mm. The maximum headline length of these should not exceed 150m. Closed seasons: For the artisanal sectors, the ban on fishing with chambo seines in Lake Malawi and Lake Malombe (November to December) and the nkacha seines on Lake Malombe (January to March) should be lifted and no closed seasons imposed. The closed season for Maldeco ringnetters will not be lifted until the effort expenditure of this sector is fully assessed in view of the forthcoming addition to their fishing fleet. Future monitoring activities: It is considered a matter of high priority to monitor closely the status of the fisheries in Malawi. In particular the catch composition of the bottom trawlers and the chirimila fishery in Lake Malawi and the development of the nkacha net fishery in Lake Malombe. The MTF data collection system should form the basis for continued monitoring. This monitoring should be supported by biological investigations. 3 COMPARISON OF THE AQUATIC ENVIRONMENTS OF LAKES MALAWI AND MALOMBE. 12.2.1 Haplochromine trawl fisheries - current assessment and management practises. Map showing the project's working area and statistical divisions (minor strata).